Okay. Guess I'll not be doing the Vocaloid Spotlight post today, since I'll have to take my time to go through over 3 weeks of ranking videos to choose lol. But for today, I'll just be posting a little teaser on what I plan to do tomorrow (besides blogging), since I'm on leave/off (no need go camp!). 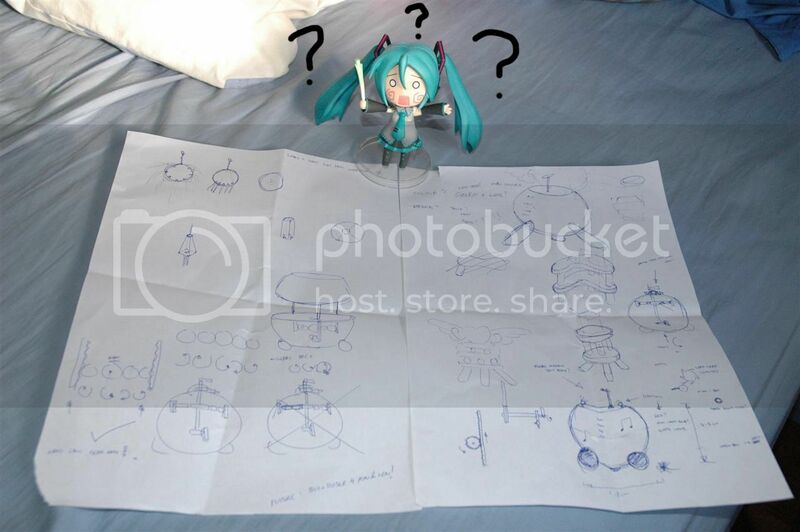 Looks like Miku is slightly confused on what's going on. Upon closer look, she realised!! The Miku Stage!! A ~Pet Project~ of mine. 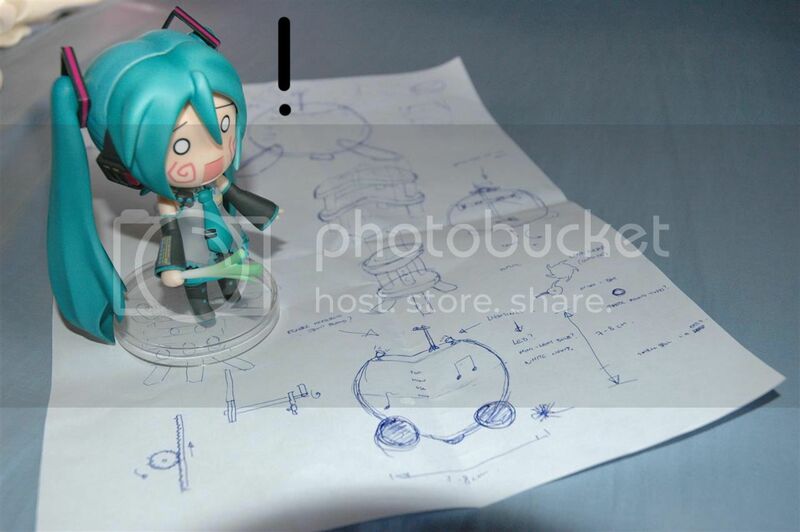 I was actually planning to make a mini-stand for Miku, so that she would be able stand on it and reach the average height of most 1/8 figures (reason to come soon, but not in this post ^^). Since I didn't have much to do in camp today, I took out some paper and did some sketches on what it would look like. Initial designs were...well... just too simple and not unique (you'll be able to see 2 ugly double layer stand-like drawings on the paper), since I was thinking of making it easy to build. But as you can see, the final settled design is that of a mini ball. It's surely going to be much harder to build, as compared to straight even surfaces, and I intend to work using Balsa wood (it's very light and easy to work with wood, and I used to work with this material when I built Control-Line Model Aircrafts before). It looks like I'll have to stick multiple layers and sand them down to create the ball shape. I had also added a few other unplanned items, but would make it alot more fun in building it, and might make it look nicer at the end. I'll be sourcing for materials tomorrow, and hopefully will be able to create the overall shape of the structure by Saturday (I need it by then). Since this is just going to be a prototype, the gears system (to allow the upper part of the stage to be able to lift up higher, for those taller figures), lighting, props etc. wouldn't be installed till later, due to the time constraint, and calculations required for the gear ratios, wirings etc. I'm still thinking of what material I could use for the final product, something that would look nicer and also easy to work with, and also thinking about colour combinations to paint it... But well, there's still time for that. That's about all the teaser for now, time for me to go back reviewing more Vocaloid videos, and maybe watch a movie on television to chill abit. Till tomorrow's post, Signing out.